System requirements: None. Compatible with all devices, platforms and browsers. Designed to display date and time based information, AnyStock is the ideal tool for client reporting and performance reporting applications. Reports and Dashboards are visualized with scrolling, drill downs, panning and zoom functionality available in all of our HTML5 charts. AnyStock brings analysis of your FOREX, commodity and investment market data to life. The ability to review long term and large data sets can easily be handled with scroll, pan, and zoom controls. 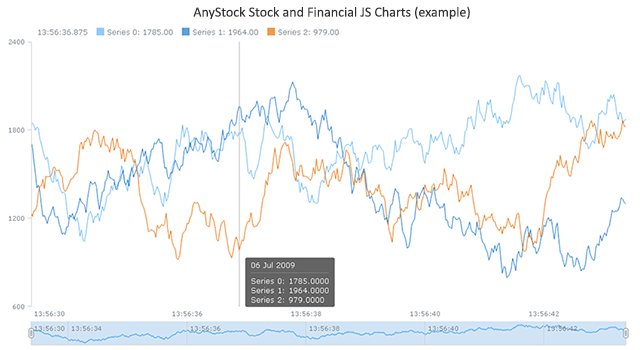 In a matter of weeks AnyStock will start offering a wide variety of even more financial chart types (including Candlestick, Spline, Range Column, etc. ), technical indicators (including SMA, EMA, MACD, Bollinger Bands and PSAR, to name just a few), and drawing tools (including Line segment, Ray, Trend line, Trend channel, Andrew's pitchfork, Fibonacci fan, Buy/Sell signals, and many others). Adding news events (analyst opinions, insider trading, dividends, and key developments) which improve the ability to analyze information effectively will also become available soon and make an important contribution to the super fast JS based visualization of financial data with AnyStock.